My slim frame may show otherwise, but I love to eat. And that’s the end of my kitchen story. I am only on the receiving end as I don’t know how to cook. Well, I can cook rice in a rice cooker, and fry basics like eggs, processed meat, and chicken. Aside from that, I’m a total stranger to the kitchen. I’d love to learn how though. This interest for cooking was reignited at Philips #NothingBeatsHealthyEats caravan held recently at SM City Cebu. Being able to cook tasty yet healthy food, in a limited amount of time, is an essential part of a happy lifestyle, especially ours now which is very fast-paced, we almost have no time to sit and savor a good meal. However, achieving this can be difficult, because it is time consuming to find cooking methods that are low in fat, and also produce great-tasting results. After all, we grew up believing that healthy food can never taste good. In our urban landscape of today, most of us are so attached to our hectic schedules that we fail to maintain a balanced lifestyle. But, studies have revealed that Filipinos are increasingly becoming more conscious of staying healthy. Philips strives to make the world healthier and more sustainable through innovation. With its long history, Philips understands the needs and desires of consumers. It has a strong heritage of delivering innovation that improves lives. As the brand reaffirms and strengthens its advocacy in motivating Filipinos of all ages and walks of like to make healthier choices, Philips has launched its #NothingBeatsHealthyEats caravan to encourage Filipinos to adopt a healthier lifestyle. Celebrity mommy, Bettina Carlos; celebrity chef, Martin Jickain; and restaurateur, Chef Edward, joined forces to put together a healthy spin on a menu of Filipino favorites in Cebu. 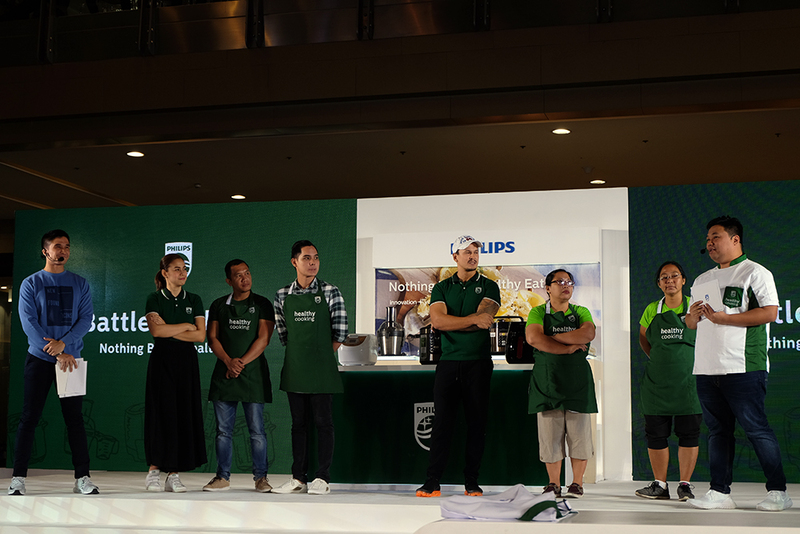 For the Cebu leg, Team Bettina and Team Martin engaged in a friendly cook-off competition on which team can create the best Cebu pochero within one hour using Philips healthy kitchen solutions. I was surprised to see blogger friends Migo Variacion and Gibben Sinco teamed up with Bettina, so I was secretly rooting for them. Team Martin came up with the traditional authentic pochero, while Team Bettina chose to be more playful and made their pochero’s soup a bit thicker, plus they added a mango puree to pair with it. At the end of the cook-off, Team Bettina emerged as the victors.